This year’s World Antibiotic Awareness Week (WAAW) focuses on the crucial role of health care workers in reducing antibiotic resistance in health care environments through infection prevention and control (IPC). Health care-associated infections (HAI) are one of the most common adverse events in care delivery, and most of them are caused by antibiotic–resistant organisms. Effective IPC is a simple yet fundamental step that helps defend the power of antibiotics. WAAW aims to increase awareness of global antibiotic resistance and to encourage best practices among the general public, health workers and policy-makers to avoid the further emergence and spread of antibiotic resistance. 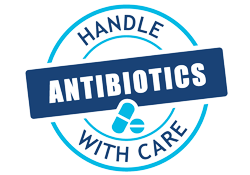 The overall theme of the campaign, Antibiotics: Handle with Care, reflects the overarching message that antibiotics are a precious resource and should be preserved. They should be used to treat bacterial infections, only when prescribed by a certified health professional. Antibiotics should never be shared and the full course of treatment should be completed – not saved for the future. WHO/Europe joins the United Nations General Assembly’s call for immediate action against antimicrobial resistance (AMR) and urges all countries in the European Region to take part in WAAW. As resistance of microbes to antibiotics knows no borders, this is a unique opportunity to join the global community in advocating for prudent antibiotic use. WAAW continues and broadens the scope of European Antibiotic Awareness Day, a European initiative that WHO/Europe joined in 2012 and extended to non-European Union countries.